Preheat the oven to 325F. Lightly grease and flour a 9×5 inch loaf pan and shake out any excess flour. You can also use a baking spray instead if you have one. In a medium sized bowl, sift together flour, baking powder and salt. Set aside. In a separate bowl use an electric mixer to cream butter and sugar until light and fluffy. Slowly add eggs and beat until incorporated. Add vanilla and continue to mix. In at least 3 parts, add flour and mix until just combined. Pour 1/3 of the cake batter into the prepared pan. Drop half of the Nutella by spoonfuls on top of the batter. Repeat layer. Spoon the remaining 1/3 of cake batter on top of the Nutella layer. Using a butter knife, carefully swirl the layers. I did about 3 back and forth swirls both horizontally and vertically. Bake for 1 hour and 15 minutes, or until a toothpick inserted in the middle of the cake comes out clean. Let cool in pan for 5 minutes. 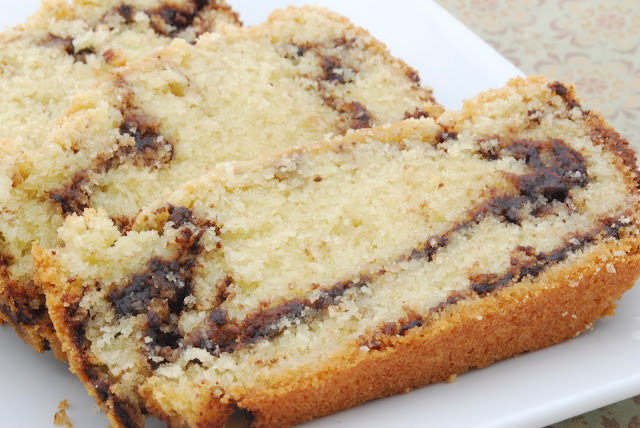 Carefully flip cake onto a wire cooling rack and let cool for at least 1 hour before slicing. I’m pretty sure we only let it cool for about 15 minutes.